Nice! Have fun with it! 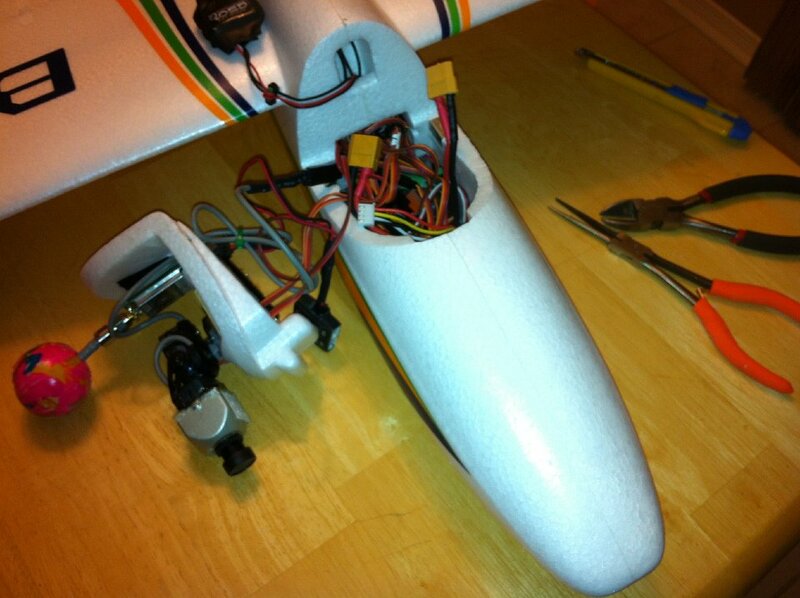 It will be interesting to see how the flying experience is compared to my scratch builds. What ESC are most of you running. Considering a Bix2. Turnigy Plush 30A works fine, I ran it off a 25A plush as well although it would get a little warm. The Bix 2 is pretty heavy and slow, don't expect great vertical performance or sailplane like glide slopes, but it's still very stable and easy to fly. Just try not to bank too hard as it will want to fall out of the sky. Magnets to lock the camera down. So I can move it from plane to plane. So many wires. Not impressed. Moved the OSD and added some zip ties. I will order some shorter servo wire extensions. OSD inside the fuse works better. Did you fly it first without the FPV gear? Looking good! Did anyone catch that HK is releasing a Bixler 3!?! I've not flown the plane yet. I'm going to fly without the FPV gear and go from there. Just rigging it all up and taking into account the CG. Yes saw V3. Might be interesting. V3? Do you have details on that? Maiden flight was a complete success. 8 min flight and the battery still showed 3.96V on each cell. So this will be a great slow flyer. Nothing special but my reaction to the sailing nature was good. Specially after flying the T-28. 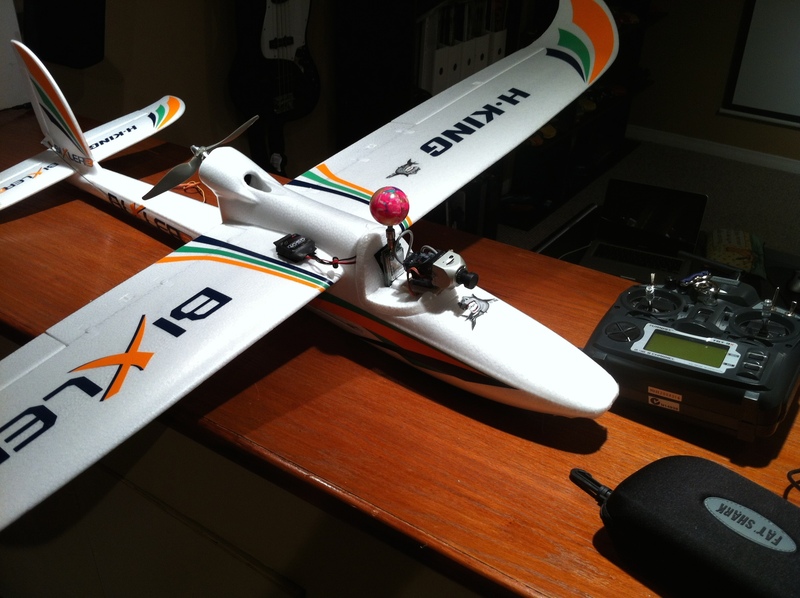 I've been flying my Bixler2 for a solid year now with no real complaints. It flies and handles excellent. I bought it after frustration learning collective pitch helis and it sure has met my needs. 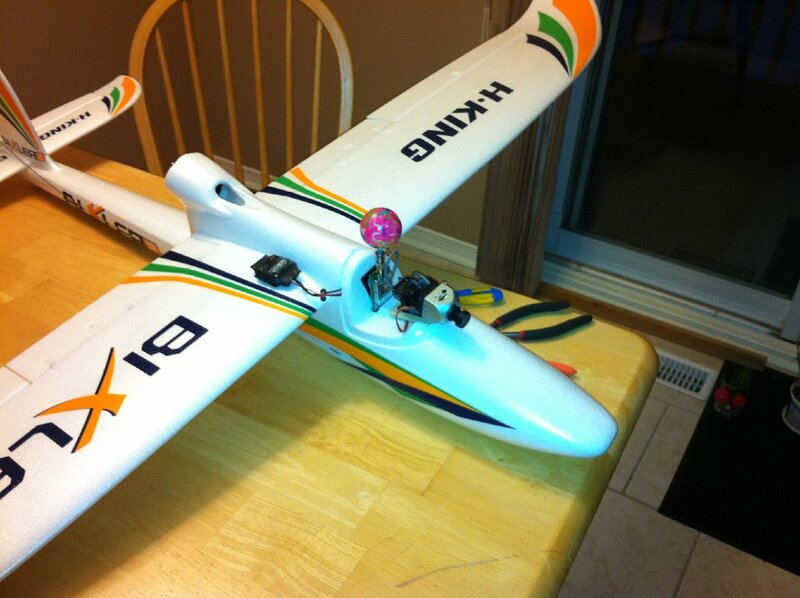 I wanted a plane that was easy to fly, affordable and flexible if I wanted to FPV. Bottom line, I've got 4 planes in my hanger now and I keep coming back to the Bixler2 when I just want a relaxing fun flight even in windy conditions. I've flown it in gusty winds that were so strong it was bending my double-carbon spar quite readily and it was still quite controllable. I've included the build parts below as I am VERY satisfied. The motor is a tad more than required, but it's nice to be able to pull out of "whoopsies" when needed, while seemingly not sacrificing flight time. Do a control surface check, every flight....WITHOUT QUESTION! Yea, I forgot to snap my elevator clevis and did a full throttle face plant on my second flight. 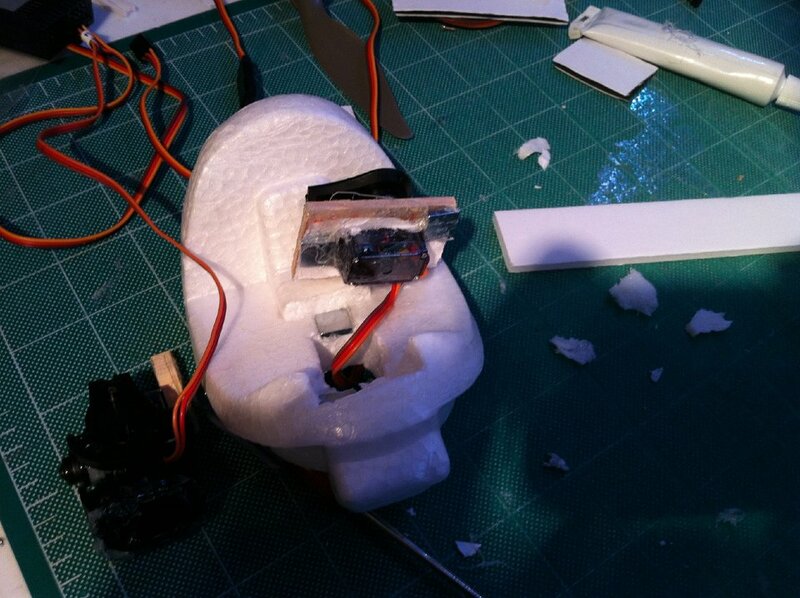 Just dipped the nose in almost boiling water, it swells back up to normal, glue it back together and fly again! The EPO foam is very repairable. And don't be affraid to use packing tape on the nose and underbelly. Helps for the inevitable whoopsies and rough landings. 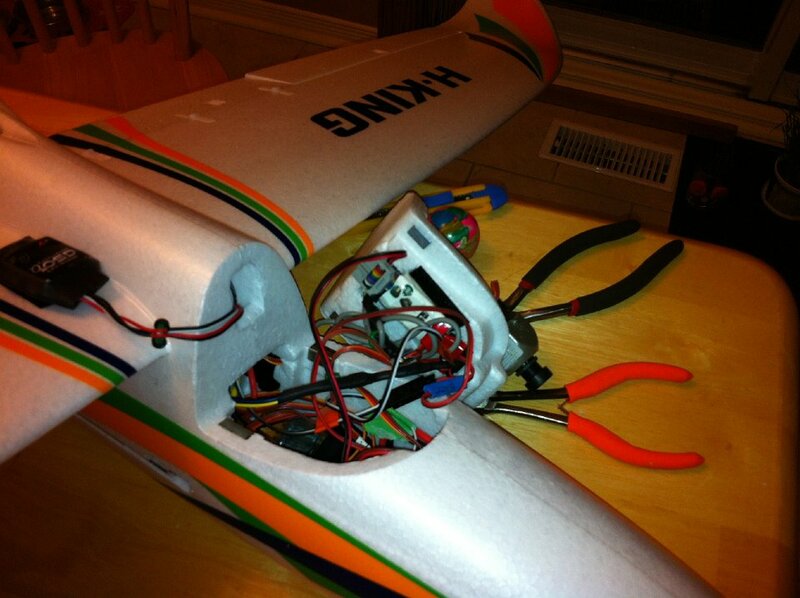 Or you can simply splice the servo wires and extend them with your own wire as I did. But these are super easy. I heard that the bixler 3 was coming soon, anyone know anything about this? I'm going to run with the stock motor for now but on my next HK order I'm tempted to pick up a 1000mha 3S to power my FPV gear leaving the flight battery alone. 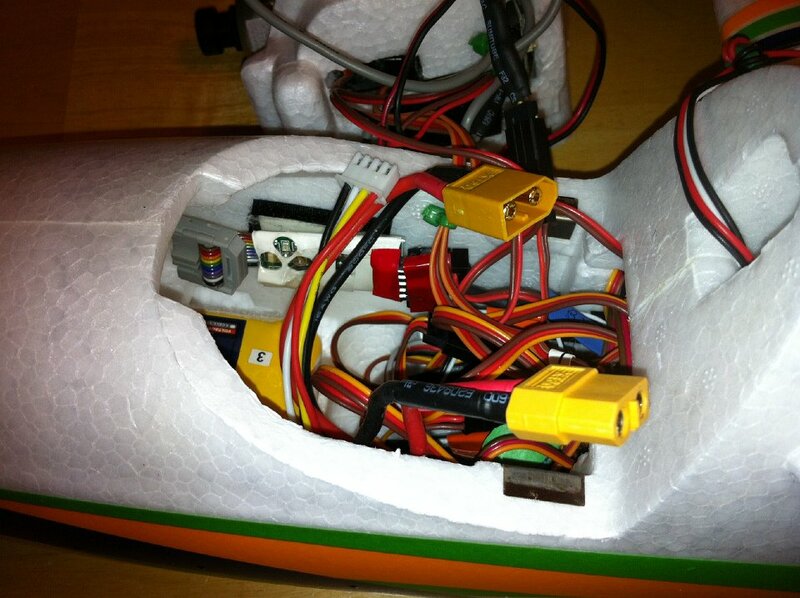 This weekend I hope to do a lot of FPV flying. afaik the only rumor was a HK picture on facebook with a Bixler3 logo. No dates or additional info so far. Easter weekend this weekend... So I'm going to take my son with me to the flying field. 2nd receiver with a power pack all setup in the Bixler. I'll pass the FatShark goggles to my son and let him control the pan/tilt of the camera. Should be fun. I'll fly LOS but let him suggest direction and so on. Still working with Fat Shark on the camera colours. Only real issue was my goggles fogged up so I had to remove them, drop the altitude and finish the flight of LOS. Here's my take on installing magnets to hold the wings in. All of the magnet mods I've seen put magnets in to hold the wings to each other. I did some test-fitting and found that the wings still had a lot of play relative to the airframe, which I didn't like. So I put magnets in the top and bottom of the wing cavity so that the wings would attach to the frame instead of to each other.